Popularly known as the ‘Music City’, Nashville is the capital of Tennessee. This city is the hub of country music, and since the 1920s, it has been attracting aspiring singers and musicians. The city is also home to the world famous of Grand Ole Opry. Today it has emerged as a top travel destination with a fantastic food scene, exciting music venues, vibrant honky-tonks, pubs and more. Since Nashville is a top travel destination, there are quite many hotels each meeting the needs and budgets of the tourists. If you are looking for cheap hotels in Nashville or boutique hotels in Nashville, you will find it all here. Getting the best Nashville Hotel deals is a little tricky, so we at MyFlightSearch have partnered with top domestic as well as international hotel chains to offer you with the best hotels in Nashville TN. Check us out to find cheap hotels in Nashville and save big on your trip. Located 5 miles away from the Downtown, this is the main airport of the city as well as the state of Tennessee. Apart from its main getaway to the rest of the country, the airport and its nearby area also offers tons of accommodation options for every need and budget. This airport named after John Childress Tune, is located in the western part of the city and serves as a great option for travelers looking to book a hotel close to the airport. An all-purpose venue which was built in 1996, Bridgestone Arena is the home ground of the Nashville Predators from the National Hockey League. A convention complex location the downtown area, Music City Center covers an area of over 2,100,000 sq ft.
Nestled by the banks of Cumberland River, this park is a venue for many concerts and festivals in the city. CoolSprings Galleria is an enclosed shopping mall which houses many retail stores, departmental stores, and a food court. This is a live performance venue and also the home to Grand Ole Opry from the year 1943 to 1974. This is a regional shopping mall in the city with more than 100 stores and houses many fantastic restaurants. Downtown Nashville is the business and entertainment district of the city. Home to many of the points of interests like Frist Center of the Visual Arts, Bridgestone Arena, Country Music Hall of Music & Museum and more. There are plenty of restaurants and nightclubs to be found here as well. You will also find a plethora of hotels here, right from budget to luxury ones. The Opryland neighborhood is home to the world-famous Grand Ole Opry. There are quite many musical attractions around this area like the Willie Nelson Museum, the famous Nashville Palace and more. Opry Mills Mall is another popular destination, especially for shoppers. The district also has many hotel options. Midtown neighborhood is known for its wide selection of hotels and also its restaurants. From seafood restaurants to Italian eateries you will find it all. There are few musical venues around this neighborhood as well. The Vanderbilt University is also nearby and a great place to take a stroll along the beautiful campus of the University. Average cost of a hotel room in Nashville? The average cost of a hotel room in Nashville is around $70 to $90 per night. Average cost of hotels during the weekend in Nashville? The average cost of hotels during the weekend in Nashville is around $100 to $130 per night. Which are the most popular Nashville neighborhoods to stay for Business Traveler? Downtown and Midtown are the popular Nashville neighborhoods for Business Travelers. How much do you tip a porter at a hotel in Nashville? $1-$2 per bag, depending upon the service provided. Best Time to Book a Hotel in Nashville? Spring and fall are the right to book a hotel in the city as Nashville hotel prices are quite affordable during these seasons. Winter is the off-season so you can expect to grab bargain Nashville Hotel deals. Nashville International Airport is the main airport connecting the city to various domestic as well as international destinations. Some of the top airlines operating flights to this airport are British Airways, American Airlines, Southwest Airlines and more. 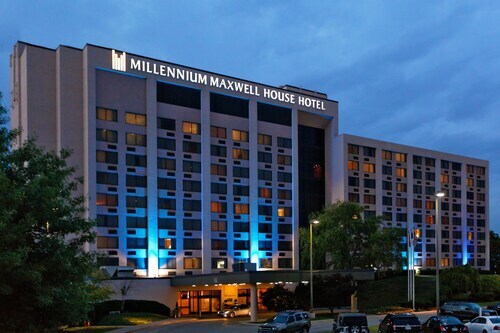 You will find many hotels near Nashville airport, whether it is cheap motels or boutique hotels in Nashville. You can save big on accommodation too by availing the best Nashville hotel deals on MyFlightSearch. The months from May to July are the peak tourist season in Nashville. The city gets visitors from far and wide. Moreover, many festivals and concerts take place during this period. CMA Music Festival is one such festival that is held in June and many celebrated artists perform in it. As many tourists visit the city at this time, Nashville hotel prices soar up. During late spring and early fall, the weather becomes delightful and the city is also less crowded. During these seasons Nashville motels and hotels give massive discount. Winter is considered an off-season, so you can expect to get some fantastic Nashville hotel deals. Grand Ole Opry is considered as one of the best performing venues by stalwarts like Garth Brooks, Carrie Underwood. While you are here, try to catch an action-packed concert here, you will cherish it for a lifetime. Visit Grand Ole Opry also has the oldest running radio show in the nation. Looking to experience something unique and special on your visit here? Take a helicopter tour of Nashville with Helistar Aviation. You will surely fall in love with the tour. Also known as the ‘Music City,' there is no shortage of live concerts and shows here in Nashville. The city is home to some of the most amazing live concerts venues and music festivals in the country. Try to plan your visit during the CMA Music Festival, Live on the Green Music Festival and Country Music Association Awards. Located in Downtown Nashville, this museum is a must-visit attraction for all. The museum showcase the history of country music through various exciting exhibits such as costumes, gold records, guitars and more. The museum is also the home to the famous Cadillac that once belonged to Elvis Presley. Just a few minutes away from the city center is the replica of Athens’ Parthenon. It was originally built in 1897 with wood to honor the centenary celebration of the state and later was constructed with concrete. Today, the Parthenon displays a great collection of paintings by 19th and 20th-century artists as well as a replica of the statue of the goddess Athena Parthenos. Belle Meade Plantation is a Greek-style mansion which was built in 1845. During the two day Battle of Nashville in 1864, the Union and Confederate army fought in the front yard of this beautiful mansion. Even today, the evidence of gunfire can be seen on the stone columns of this 19th-century building.